Publisher: Two Hands Games CO., LTD.
Lord of Dungeon is a manage-and-collect game that you can control your own town and dungeons until you become the emperor of the world. Focus on money making and be the most wealthy Lord, or collect unique champions to become mightiest Lord in the world – It’s your choice. Your favorite monsters are working for you. 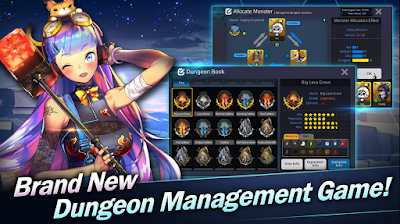 - 'Lord of Dungeons', a new Dungeon Management Simulation Game for mobile will open globally including Philippines on January 11, 2018. On the other hand, in order to commemorate the launch, the player will be given the right to reclaim the master battle cemetery and the game cache, which are the highest rankings in the game. They can attend various open memorial events such as attendance and leveling up. Abour the publisher, Two Hands Games (CEO, Junyoung Kim) is a new Korean game developer and publisher. The CEO, Junyoung Kim was founder of Ntreev soft that developed ‘PangYa’, the famous golf game globally.